(BOSTON; November 30, 2018) – During this week’s International WorkBoat Show in New Orleans, Boston-based Sea Machines Robotics proved the capability and reliability of its autonomous-command technology with a series of six live demonstrations that remote-commanded a workboat in Boston, more than 1,500 miles away. 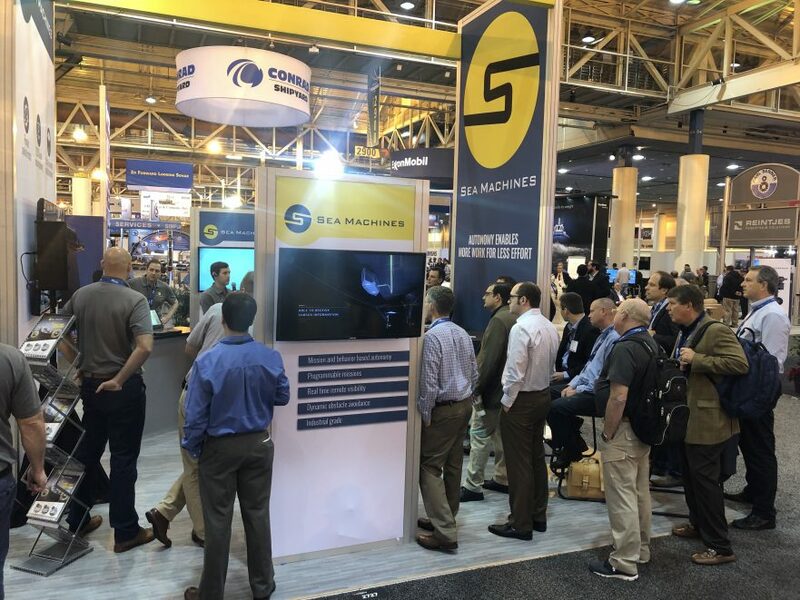 For each performance, show attendees watched as the New Orleans-situated operator planned and deployed missions over secure connection to an SM300-enabled workboat in Boston. Missions included autonomous waypoint following, dynamic obstacle avoidance and remote payload control of an on-board fire monitor. Following the missions, the operator discussed the various applications for the technology, as well as the benefits, such as increased productivity, performance and safety – which ultimately translate to increased profitability. Last month, the company made commercially available the world’s first industrial-grade autonomous and remote-control products purpose-built for workboats. This introductory line of intelligent command and control systems, which include the Sea Machines SM300 and SM200, is ideally suited for the demanding challenges of offshore commercial, scientist and government applications. The SM300 provides remote-command, operator-in-the loop autonomy for survey, spill response, dredging and security/surveillance operations. Capabilities include autonomous command, remote control, obstacle avoidance, pre-planned route following and collaborative operations. For customers seeking remote-control operability only, the company offers the SM200, with ideal applications aboard fireboats, utility craft, spill-response vessels and others. Sea Machines is also developing advanced perception and navigation assistance technology for a range of vessel types, including container ships. Trials for this product have already begun aboard an A.P. Moller-Maersk new-build ship. Headquartered in the global tech hub of Boston and operating globally, Sea Machines is a leader in pioneering autonomous control and advanced perception systems for the maritime industry. Founded in 2015, the company builds autonomous vessel software and systems, which increases the safety, efficiency and performance of ships, workboats and commercial surface vessels. Learn more about Sea Machines at www.sea-machines.com.